(Nanowerk News) The folks at InkFactory decided to test the idea of creating a working 3D printed Inkjet cartridge. In June, the team purchased a MakerBot Replicator 2 desktop 3D printer, along with a selection of coloured PLA plastics, and a plan was drawn up to execute the project over the coming weeks. Top of the list was choosing a suitable inkjet cartridge and inkjet printer. They decided on a range of KODAK ink cartridges (Kodak 30C and Kodak 30B) for this 3D printing project. To print an object in 3D you need to have an accurate scaled 3D drawing of the object. So using SolidWorks, a leading CAD software package that can be used to create 3D objects, the KODAK 30C and KODAK 30B ink cartridges were replicated and exported as industry standard .STL files. With the 3D models in an industry standard file format, the next step was to use the free software that came with the MakerBot 3D printer to create a file that could be sent to the 3D printer for printing. 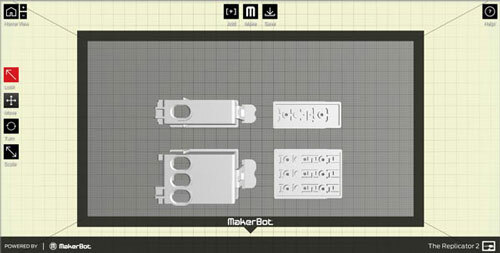 The free software is called MakerWare and contains a “slicing engine” a special algorithm that tells the MakerBot 3D printer what to make and how to make it. 3D Objects Imported Into MakerBot MakerWare. The next step was to export the 3D ink cartridges – using MakerWare – into the 3D printer and start printing the 3D ink cartridges. During the process, several modifications had to be made to the 3D drawings, but soon the team had a working inkjet cartridge printed on the 3D printer. 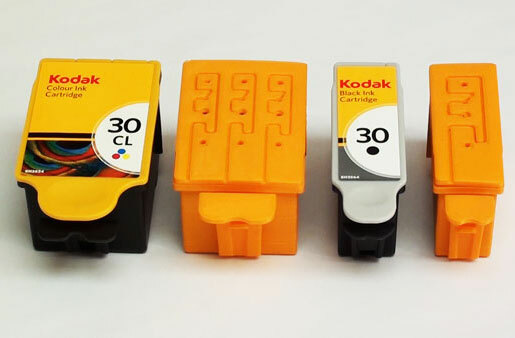 Original and 3D Printed KODAK 30 Black Ink Cartridges. Once the ink cartridges had been printed the next step was to place them in an inkjet printer and attempt to print a test page. They achieved this by purchasing a KODAK ESP C110 colour inkjet and then replacing the original KODAK ink cartridges with their own 3D printed versions that had been filled with the appropriate inks. You can see the results in the video below.